With recent talk of whether banning tracking software would be good for online poker, James “SplitSuit” Sweeney leaps to the defence of the HUD, arguing that the edge it affords is overstated and misunderstood. In full disclosure, I love my HUD. I’ve been using a Heads Up Display since 2006 and have spent countless hours tweaking, customising, and meticulously colour-coding different statistics to help me be more productive while playing, and play at more tables at the same time. That being said, I have something rather scandalous to share with you: I truly feel that HUDs are not as useful as many players assume they are. This may surprise you because as a coach and I am often helping my students by teaching them to better use their HUD in game in order to improve their decision making processes. To prove my point, let’s analyse two theoretical players named “Walter” and “Jake” whose typical game play preferences are very different, but their game play and choices are modeled on real life players. First, there is Walter who plays high stakes $25/$50NL games as his bread and butter. Walter plays regularly but his opponents are mostly the same 40 to 50 players, day in and day out, with rare exception. A HUD isn’t necessary for Walter. He already knows most of his opponents’ traits; in fact, he has played live with a few of them and he has watched a handful of them play on TV in high stakes cash games. Walter takes careful notes and uses his experience and knowledge to consistently generate a conservative yet steady win. HUD stats for him offer no extra value since his notes and experience trump averaged HUD stats. Generally, Walter is only playing one to two tables at most because there are fewer options to choose from at these stakes. This means he can actually use his notes and reads in-game with great efficiency. Although we would certainly be helped by post-game analysis from tracking, the truth is the HUD doesn’t really offer any significant productivity advantages for Walter. On the other hand Jake plays $0.50/$1NL. He plays regularly and his player pool is many multiples the size of Walter’s. Jake also gets to play many more tables at the same time than Walter can and uses his HUD to be more productive while playing so many tables. If Jake plays ten tables of 6-max, that means he’s against 30 to 50 other players at the same time (assuming some of his opponents are also playing on multiple of his tables) and in each session Jake is running into tons of new opponents every day. So while Walter plays against the same 30 to 40 players every single month, Jake may run into much more than 1,000 different players in a month. Notice that at no point while we were looking at Walter or Jake did we say the HUD increased or would increase their edge while playing. This is because a HUD is a productivity tool; it does not give the player an edge. The player’s skill at poker is where the edge comes from. Many players have an irrational fear that players using a HUD are getting extra information that they can use to exploit people, but that’s not true at all. A HUD gives nothing more than statistics of past actions, measured in a number of actions taken, divided by the number of opportunities to take that action, all of which you could figure out on your own with a pen and paper. In a live game you can easily remember your opponent’s playing style, but when facing thousands of opponents each month online it becomes a challenge to remember who your opponents are. But rather than play one table very slowly, doing it all with pen and paper, you can use a HUD and spend that saved time playing more tables and getting more hands in the same amount of time. Now, a player who is used to 45 hands/hour at a single table could theoretically play 450 hands in the same amount of time if they multi-table ten games at once. I’m sure by now some of you are thinking: “But wait, how can these multi-tabling HUD-users be good for the game?” That’s a fair question and an often misunderstood concept. Let’s start with the absolute basic understanding that poker rooms need recreational players in order to flourish. There need to be new players coming in and enjoying their free time on the virtual felt, but it’s also true that these recreational players commit few hours to the game and are more likely to quit playing if they continually lose. But what are these recreational players looking for? Simply put, they are looking for action, the exact same thing that the “regs” desire. 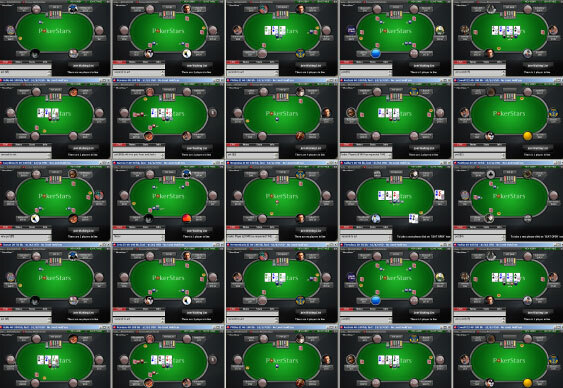 Players of all types love a number of games and tables to choose from and full games when they sit down. But what makes recreational players slightly different from more active players is that they generally don’t want to start tables to get the action started, they just want to be able to log-in and begin immediately playing in full games – which brings us to the beneficial aspect of those multi-tabling players. Multi-tablers, by definition, play more tables, which means more tables are running, and there are more options for other players to chose from. Multi-tablers help game creation and fill up otherwise empty seats, which makes the lobby look full and active – something all players want. And thus the cycle begins. Recreational players bring mutli-tabling regulars and multi-tabling regulars make the rooms look more active and full, thus enticing new recreational players. That’s not to say that every aspect of multi-tabling is good; for instance, they may take a bit longer to make decisions which slows the overall game down, but the overall impact is actually net-positive for the online poker ecology. Additionally, it should be noted that players who use a HUD are more productive but not necessarily better players. If all players who used a HUD were winners, there wouldn’t be any poker games running online; the game would have died a long time ago. In fact, it is often overlooked that there are some players who would win if they played one or two tables and spent their time focused on the decisions at hand with no HUD, rather than multi-tabling with a HUD. HUDs certainly aren’t for everyone or every situation, but whether you choose to use one is a personal decision that should factor in your productivity and goals with poker. Lastly, we should not overlook the fact that Walter may actually benefit from a HUD after all – not necessarily by using it for the statistics, but rather for its other features. For example, a HUD allows you to pull up previously played hand histories and mark them with ease. Couple that with the ability to take notes on players and hands in real-time, even if you chose to disable the display of statistics, the use of a HUD is a clear win/win. Think about your goals in poker and how a HUD could fit in your playing workflow. If you don’t feel a HUD is right for you, then don’t feel pressured to use one. But also, don’t think that just because you use a HUD you will automatically become the next durrrr or Isaac Haxton; the only real way to win in poker is practice and experience. James Sweeney is a noted poker coach and author of the book Dynamic Full Ring Poker: Beyond the Basics, published by Daily Variance. James contributed to the tutorial content development and support of PokerTracker 4 and remains an active player advisor to the PokerTracker management team. His single-serve coaching video content is available at splitsuit.com.